If you have been injured from taking the dangerous medication Risperdal, Risperdal Consta, Risperidone, or Invega, you may be entitled to specific damages or your injuries. It is very important that you speak to an attorney as soon as possible about your injuries so that you can protect your rights as an injury victim. Men who were given Risperdal as boys or teenagers and are now still suffering from enlarged breasts still have the right to seek damages. Schedule a consultation with a Risperdal attorney and learn what rights you have as an injury victim of Risperdal. Fill out the form on this page for a free case evaluation. Were you or your son taking Risperdal? Select One I have taken Risperdal My son has taken Risperdal Other Do you currently have a lawyer representing your claim? qualify by filling out the form. an advocate or attorney ASAP. Risperdal and Risperdal Consta, (Generic Named Risperidone) are prescription medications that are categorized as anti-psychotics. Risperdal is available in pill form, while Risperdal Consta is an injectable medication for patients who need longer term effects from the medication. Risperdal was first approved by the Food and Drug Administration (FDA) in 1993 for the treatment of schizophrenia in adults. Risperdal was later approved for treatment of Bipolar ! disorder in children and adults, Irritable dementia in the elderly, and autism spectrum disorders in children and adolescents. Risperdal has also been marketed as an off-label treatment option for people with Attention Deficit Disorder (ADD). 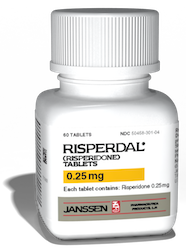 Since its release, Risperdal has been associated with many serious side effects, including breast growth in boys and men, movement disorders, diabetes, and increased cardio-vascular risks. In 2006, the FDA required the makers of Risperdal to place a black box warning on the medication because of its association with serious side effects. At this time, there are over 420 lawsuits that have been filed against the manufacturers of Risperdal for the serious side effects that the patients suffered. In addition, there have also been several serious criminal investigations and settlements regarding this medication conducted by various government entities. Risperdal and Risperdal Consta were developed and manufactured by Janssen Pharmaceuticals. Janssen is a subsidiary of the Johnson and Johnson Company. Risperidone, the generic version of this anti-psychotic medication is manufacture by Patriot Pharmaceuticals, another subsidiary of Johnson and Johnson. Most lawsuits that involve breast growth (Gynecomastia) name Risperdal or Risperdal Consta as the main medications that caused harm. However, several new lawsuits have recently emerged that have also named the medication Invega, another anti-psychotic medication produced by Janssen Pharmaceuticals. At this time, there are over 420 lawsuits filed against the makers of Risperdal. A majority of these lawsuits are related to Gynecomastia. Gynecomastia cases abnormal breast growth in young boys. Many of these boys and young men have had to undergo surgical procedures (mastectomy) to correct the problem. This has caused physical and emotional scarring to the injured parties. Additional lawsuits filed against the manufacturer include claims that the medication caused the onset of a movement disorder known as tardive dyskinesia, high blood sugar and the onset of Type II Diabetes, Heart Attack, Stroke and Death. The first case filed against Risperdal regarding breast enlargement came in 2008 when six young boys filed a lawsuit against the manufacturer. Of these six boys, two had undergone mastectomies to correct the problem. The other four were subjected to liposuction procedures and other forms of treatment. In 2010, a 21 year old man filed a awsuit against Janssen Pharmaceuticals for abnormal breast growth. This man had taken this medication between the ages of eight and 14 and now suffered with enlarged breasts. His case states a very significant act: he was prescribed Risperdal as an off-label treatment and that it was not approved for the use in children at that time. •	That Janssen Pharmaceuticals, through Johnson and Johnson, actively promoted this medication for off label uses before they were approved by the FDA. In addition to these private lawsuits, several government lawsuits have been filed against Johnson and Johnson and Janssen Pharmaceuticals in regard to Risperdal. In 2010, the Department of Justice and several State Attorneys filed a lawsuit against Johnson and Johnson for paying money to Omnicare for bogus services in return for Omnicare promoting the use of Risperdal in nursing homes and convalescent centers. At this time, Risperdal was not approved for the use of treating dementia patients. Johnson and Johnson settled the lawsuit with the government with a $112 million fine. In 2011, Massachusetts and several other states filed a lawsuit against Johnson and Johnson for promoting Risperdal for off label uses and not disclosing the serious side effects, such as onset of diabetes and cardiovascular risks. In 2012, Johnson and Johnson settled with the State of Texas for off label promoting of their medication through the Medicaid system and paid a fine of $158 million. Also in 2012, Johnson and Johnson entered a guilty plea for a misdemeanor charge in front of the Securities and Exchange Commission. While all of this information has not yet been released, filings for the case indicate that the U.S. government invested the company for its sales and marketing practices. Risperdal was given approval for sales in the United States for the treatment of schizophrenia in adults and for short term treatment for adults with Bipolar I syndrome. Through aggressive marketing, Risperdal became the leading antipsychotic medication on the market. The first new report was published by the Miami Herald about the dangerous side effects associated with Risperdal. Surprisingly, the Herald reported these side effects in children. The drug was being used to “calm” unruly foster children in the Miami area. At this time, the drug was not approved for this use. Risperdal has over one million annual prescriptions being written and is increasing sales by promoting off label uses. This medication is now being actively used to treat ADD, Autism, and Alzheimer’s. The Food and Drug Administration requires Janssen Pharmaceuticals to place a Black Box Warning on Risperdal. The FDA only requires this type of labeling for drugs with severe side effects. Despite the new warning, sales skyrocket to $2.1 billion. Duke University releases a very important study about the dangers of Risperdal in children. The study shows that this medication causes gynecomastia in boys and young men and that young girls who take this medication are having very early onset of puberty and begin lactating. The study concludes that the dangers of using this medication far outweigh the benefits in children. The FDA approves the use of Risperdal for treatment of schizophrenia only in teenagers. This approval is a surprise to many people in the medical community. The first lawsuit filed against Janssen Pharmaceuticals and Johnson and Johnson for gynecomastia occurs. Six boys are named as Plaintiffs in the suit. Two of these siz boys had to undergo mastectomies to correct the condition. A 21 year old man files a lawsuit against the drug manufacturers for physical and emotional trauma from Risperdal. This man had grown breasts after taking the medication between 1999 and 2004, a time when this medication was not approved for use in children. Johnson and Johnson settled this case on the first day of its trial in 2012. Johnson and Johnson recall 2 and 3mg tablets of Risperdal because of a foul odor reported by consumers. No information to the cause of the contamination has been disclosed. Johnson and Johnson has settled several cases filed against it for abnormal breast growth. As news of these lawsuits are made public, many more boys and men come forward with the same physical side effects as those in the lawsuits. Additional suits are filed. Risperdal Consta was recalled after several viles tested positive for contamination. The drugs were found to have chemicals in them that are used to treat wooden pallets to keep them from decaying. Johnson and Johnson agrees to pay the government $2.2 billion for illegally marketing Risperdal and encouraging off label uses for the medication. Cases continue to emerge across the country from people who have been disfigured and emotionally injured by this dangerous medication. At this time, over 420 cases are active in the court system concerning Risperdal. 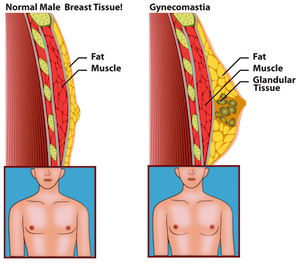 Gynecomastia – Abnormal breast growth in boys and young men. Some of these boys have also experienced lactation. Early Onset Puberty – Girls that have taken this medication are entering into puberty at a very young age and begin to lactate. Tardive Dyskinesia – Involuntary movements of the tongue, lips, face, torso, or arms. This condition can be treated but cannot be cured. Cardio Vascular Events – Many elderly people have suffered stroke and stroke like events that were taking this medication. Death – Several people have died from the side effects associate with Risperdal. Floppy Iris Syndrome – New research has been released in Canada showing that people undergoing cataract surgery who have taken Risperdal are at greater risk for Floppy Iris Syndrome. This can potentially lead to blindness. Risperdal-Settlement.com © 2019. All Rights Reserved. This Site does not provide medical advice, diagnosis or treatment. It is recommended that you consult with your healthcare provider to discuss the benefits and risks with continuing or stopping any current medical treatment or prescriptions.